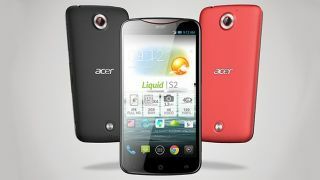 "4K recording" seems set to be this year's phone buzz-feature (sorry, "world's slimmest", you've had your day) and Acer is first to out its offering, the 6-inch Acer Liquid S2. With a full HD IPS screen, the handset comes running Android 4.2 with a Qualcomm Snapdragon 800 2.2GHz processor which gives it that 4K capability. Of course, it needs a camera too and its rear-mounted sensor is a 13MP one replete with LED ring flash. On board storage tops out at 16GB so we're not sure how much Ultra HD video you'll be able to hang on to - we're waiting to hear if there's a microSD slot on board too. While Acer's going big on the Ultra HD recording, it reckons "the real beauty of the smartphone" is "its iconic soft round curves" and the "red elements" surrounding the camera and on the earphone mesh. The 6-inch screen puts the Liquid S2 firmly into 'phablet' (sorry) territory, backed up by 2GB of RAM, 4G LTE connectivity and a 3,300mAh battery. While we expect to get our hands on the Liquid S2 at IFA 2013, the handset will hit European shop shelves at the end of October - no word on a US release or any pricing at all as yet.